Amongst the Concert venues that my orchestra and my guitar workshop have played in, there are several in Bedhampton - 1km from Havant - including Bedhampton Social Hall, and St Thomas' & St Nicholas' Churches. It would be a shame for visitors to our Concerts to cancel for fear of alien abduction, especially if the concert is for charity. So let's reassure you! There's an account of a UFO "hovering over a 700 foot drop". The Ordnance Survey Map shows the spot height is 425 ft.
A woman travels to Bedhampton to take her dog to the vet. There are no vets' practices in Bedhampton. She also promises to send a website some video footage. 18 months later it hasn't arrived. "This area of Havant suffers continuous bad weather time periods" - Oh no it doesn't! "Havana" - we think they mean Havant - not a lot of attention to detail there, is there? "I then played the film in to the computer buy the firewire format capture box that then goes in real time without no loss of quality..."
The quality is poor - it never was good! I'll let you decide, but I haven't seen any UFOs. Why not? Because (wait for it ...) Bedhampton is part of the Haven't Area! 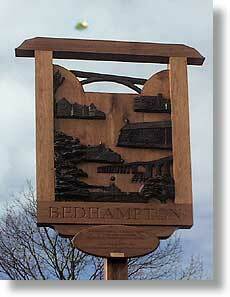 Footnote - there's a little bit of the real history of Bedhampton on my website too!